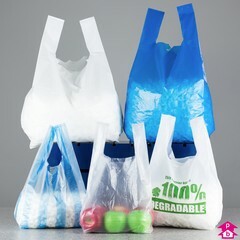 20% off three ranges of white vest-style carrier bags that will all do the job nicely. 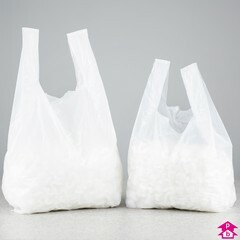 The vest-style carrier is the traditional high-density crinkly carrier used in shops and supermarkets across the world. 2 Products. 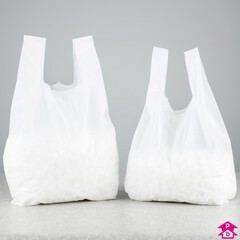 White 8 and 9 micron ultra-thin 'Sovereign' Grade Carriers. Cheap & cheerful normally, really cheap and positively joyous today. 2 Products. A stronger range of 'Supergrade' white vests, with the 18 micron Supergrade23 as an ideal economy bag for bottles, especially with 20% off. 5 Products. 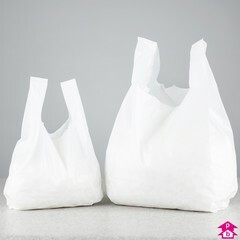 Our recommended range of stronger white vest carrier bags, combining high quality, bag strength and budget prices with today's handsome discount. Your customers will be sure to notice the difference, and your bank balance will be grateful too!